I recently joined a swap where we altered three cabinet cards in a "Patriotic" theme. These are the 3 cards that I altered and sent on to their recipients. "Celebrate America" - with glittering party banner, the Stars and Stripes, and the Declaration of Independence. Betsy Ross with her Stars and Stripes and copy of the Declaration of Independence. I colored her dress, hair and face with chalk. Stippled the background using chalk inks to give it depth and a vintage feel. Betsy Ross again, with her sewing label, stitches and trinkets, and the Stars and Stripes. I do think that her hair bow is a bit "micky mousish" though. Celebrating an early 4th of July! 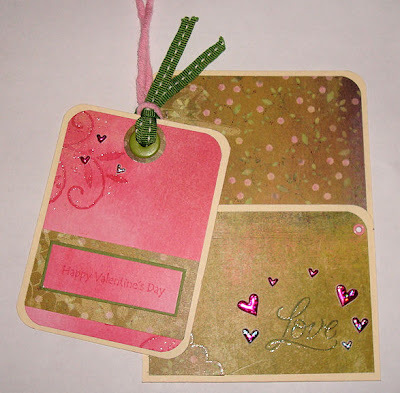 I wanted to share one of my first projects that I created for the Frantic Stamper Blog. I made this Shabby Spring Tag using a handmade a paper bag flower. Making handmade flowers has become popular lately. I made this flower from an ordinary brown grocery bag. Super easy! Click here for instructions on how to make this tag and paper bag flower. Here are a couple of variations I made using the same "recipe" as the paper bag flower. I am anxiously awaiting the return of my "skinny pages" from a recent swap. We each made skinny pages (3"x6"). They each had to have an alpha letter on it -- spelling out Christmas. Here are the ones I sent in. I will get 9 in return... spelling out Christmas. I will either make them into a small book or a banner. I love the little birds I created using a circle punch and a small "egg" shaped punch. Super easy. I think I am going to be putting these on my Christmas card this year. The alphabet stamp set I used is from Purple Onion Designs. I am very excited about my latest altered art project. I'm truly getting in the mood for Christmas already. Those that know me, know that this is unusual for me. It seems like my festive mood rarely kicks in this far ahead of the holiday. I made these altered angels for Glue, Art & Paper Studio. I am really happy with how they turned out. I will proudly display them in my home during the holidays. I used pearl ivory and gold as my focal colors with a touch of copper and brown for the accents. For many, these colors probably seem very non-traditional for Christmas. I like the earthy feel that the copper and brown accents give these angels. I started with these wooden dress forms from Glue, Art & Paper Studio. I painted two of them pearl ivory and one in metallic gold. The ivory angels were stamped with a flourish design and Brilliance ink. The Brilliance ink stamped beautifully on the painted wood and gave it a shimmery accent. I left the gold dress form unstamped as the metallic gold paint stood out well on it's own. Each set of wings are different. The base for easy is a shimmering ivory card stock. I topped them with layers of printed vellum, embossed vellum, and gold skeleton leaves. Each is cut in a different size and shape. Did you notice that each angel has a rustic bird nest sitting on her shoulders? A gold glittered dove sits on each. I also printed the words "peace, love, and joy" on shimmering ivory card stock and placed them in gold bottle caps. I attached a word to each angel. I gave each angel a flowing skirt of ribbon. I used about 10 different colors, textures, and widths of ribbon. I doubled the ribbons and draped them to one side of their waists. I left them extra long and draping. I added a wired ribbon bow to each at the waist. Also, beads that I cut from holiday "picks" were glued to the base of each angel. I hope you have enjoyed my holiday altered angels. The beautifully made wooden dress forms from Glue, Art & Paper Studio certainly made this project easy. They have such nice quality products. This truly is an easy project and can be easily personalized to your style and colors. Give them a try. I have to apologize for not posting anything new lately. Not to worry... I have been busy working on many art projects. 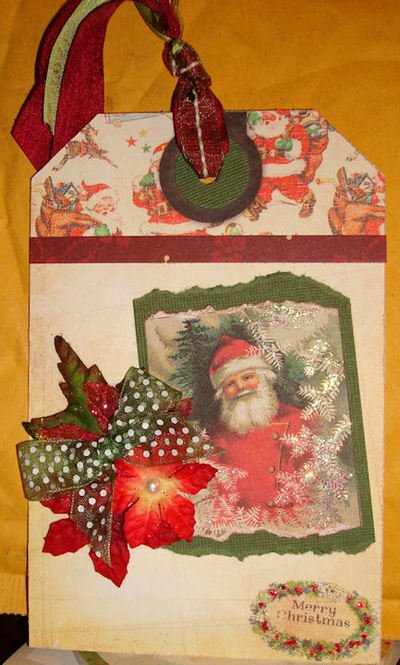 I just finished a 25 days of Christmas swap, and an altered cabinet card swap. 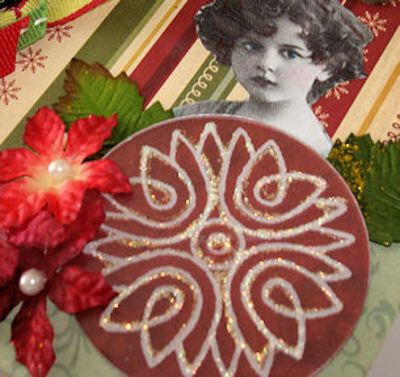 I am currently working on Christmas pages for a tall skinny book swap, a set of wooden angels for Glue, Art & Paper Studio, and trying to fit in general stamping, card making, and taking care of 3 secret sisters. Oh yea, somewhere in there I have been designing this years Christmas cards. For the altered cabinet card swap, I altered 14 cabinet cards in a Christmas Song theme. Each had to represent the title of a Christmas song. And, it had to include a santa hat on each cabinet card also. I don't want to post all of the altered cards, but here are a few. Does the song title fit? Now, the 25 Days of Christmas swap has been a fun one so far. 25 artists joined, and each of us was to make a small gift. We mailed one of our gifts to each of the other 24 participants. I have been having a blast getting the mail each day with piles of little gift packages arriving each day. Each of us was assigned a day in December that our gift are to be opened on. In the end, we each have a gift to open from a fellow artist on each and every day in December (up to the 25th). How fun is this going to be!?!?! I am really looking forward to December when the unwrapping can begin. Sorry, but I can't post a picture of the gifts I made yet. I will at a later date. I can show you what they look like in the little gift bags I sewed. This is what the other 24 artists received from me... mine are to be opened on the 15th of December. I'll be back soon. Hopefully my Christmas Angels will be done. I am very excited about them. Isn't this the cutest stamped image? I just think it is adorable. I got it over the summer but just now had the time to try it out. When I was stamping it, I thought "why not use it for Halloween cards"? I think they ended up making cute holiday cards. I simply stamped them with black Memories ink and colored them in using the MCP technique. For those that don't know what the MCP technique is - it is Magic Colored Pencil technique. It is coloring with Prismacolor pencils and using Gamsol (I use Sansodor) to blend the colors. I dusted off some of my old shadow stamps (remember those?) and made these cards. They were fun to make once again. The shadow stamps are by Hero Arts. The inks are Memories shadow inks. The olive branch stamp is by A Stamp In The Hand. I was playing in my art room one evening and came up with these Autumn cards. There isn't much stamping (sentiments only - Hero Arts) involved, but the pumpkins were fun to make. The pumpkins were made using a large oval punch. I punched 3 ovals for each pumpkin. I trimmed each oval smaller than the previous one. I chalked the edges of each layer to add depth. The stacked the layers together with foam tape. The leaves are actually small punched eggs. This shows the stacked layers of the pumpkin and the chalked edges. Just a couple of cards I made one evening. Two cards made with Hero Arts asian stamps. I think these little girls are so cute. They are colored using the MCP technique (colored pencils and solvent). These two were made with one of my favorite stamps - the chandelier. I love this stamp and use it for so many occasions. Both use printed background paper. The first is overstamped with flourishes. The second one (shimmery) was embossed with a cb folder. This card was for my nephew. Just wanted to say "hi" to him. This is a card that I recently sent to a secret sister. I was pleased with the way it came out. The pineapple stamp is from A Stamp In The Hand and was colored using Marvy and Tombow markers. The background stamp is an image from Stampers Anonymous (I believe). I just thought the images, colors, and printed paper (Basic Grey) fell together well on this card. I just finished my "fish tails" art piece. I was in a mingle entitled "fish tails". We had to have a fish somewhere on the piece of hanging artwork. This photo isn't the best, but you can see the basics of my piece. I used a 4"x6" canvas and painted it with a glaze medium and paint. I stenciled some random designs on the background using paint. I gave the background some added texture by randomly applying some distress stickles with a paint brush. I added an image of a vintage fish company label and used oil pastels around it for shading. I glazed over the label. It has almost a crackle finish to it. I embellished the piece with an "F" game piece, some netting, small sea shells, and a wire/ribbon/bead hanger. I was in a card mingle recently. The theme was "purple". Purple is not my favorite color so this was a bit of a challenge to me. I chose an Asian theme. The body of the card was stamped with several stamps -- asian face, ginko leaf, fern, coin, etc. I used black ink and Versamark clear. I made the lantern by punching out two circles of the same size -- one black and one lavender. I cut an edge off of the lavender circle and repeated it on the opposite side. I did the same to the black circle, but making sure the piece cut off was smaller. After gluing these circles together, I attached some metallic mitzuhiki cord to the back. Embellished the stamped floral image on the lantern with a glimmer pen. Attached to card on pop dots. I made this card for my nephew who is turning 14 in just a few days. Can't believe he is growing up so fast. I find it hard to make cards for teenagers. I've never had one of my own, so I am never sure of what appeals to them (and at what age). This is the card I made for AJ's birthday. I cut the guitar from a piece of printed cardstock. Stamped the sentiment. Added "latte" colored pearls to the neck of the guitar. Hope he likes the card. If all else fails, I know he'll like his gifts! 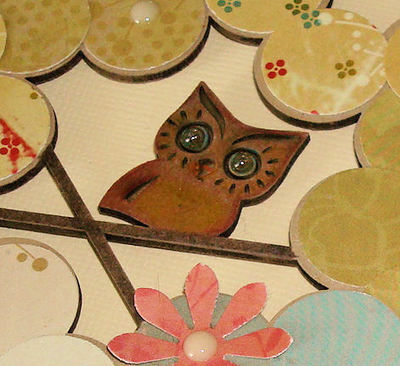 I made this cute little calendar using two medium weight chipboard coasters. The background coloring on the coaster is a fun technique that I recently created and will explain late in another post. Hint... it is made using Glimmer Mists. I cut a slit and made a fold in the back coaster to create a "stand" for the calendar. The two coasters were glue together and left to dry flat under a heavy book. Embellished with ribbon and a 3D butterfly from K & Company (I believe). The butterfly was enhanced with extra bling and glitter pen. Mother's Day is still a very special day for me, even though it is now full of remembrances and happy memories for me. This is a day I still celebrate my mom, but also miss her terribly. I can wish my mother-in-law a happy mother's day though. She is an exceptional woman. This is the card that I made her this year. I stamped this image twice and colored both with prisma color pencils and blended using the MCP technique. I cut out the two flowers and vase from one of the colored images. I adhered them to the base image to give the card dimension. Hopefully these photos show the dimension and interest you can get by simply adding a second layer. Just a few simple little cards I made a few nights ago. The background paper is from Memory Box, as is the cute little squirrel and sentiment. This photo is not very good, and doesn't show the nicely colored squirrel very well. I used colored pencils and blender. It is on pop dots. I really like these asian girl stamps from Hero Arts. They are sweet. This girl is colored using Tria markers. A very basic card. This card uses the same stamped image. She was colored with colored pencils and blender. Sorry about the poor photos. They don't do any of these cards much justice. I decided to dust off some stamps I hadn't used in awhile. Remember all of the Hero Arts flowers from a few years back? Well, here are some current cards I made using a few of them. I apply ColorBox chalk inks directly to the stamps to get this effect (cats eyes are easiest to use for this). I use several colors on each flower and stem. Top cards uses Memory Box paper for background. Added ribbons and felt flowers. Happy St. Patrick's Day to everyone! Just a couple of quick mini cards. I think this is a cute pair of stamps. I believe that they are from Inky Antics. It is true... every buggie needs some buggie! I have made these before, and have probably posted samples on my blog before too. I like to make cards that are different from a basic folded card. This can be made using a library pocket as the base to hold the tag, or just from a cut up manila folder (like here). I used Memory Box papers on the tag and pocket. 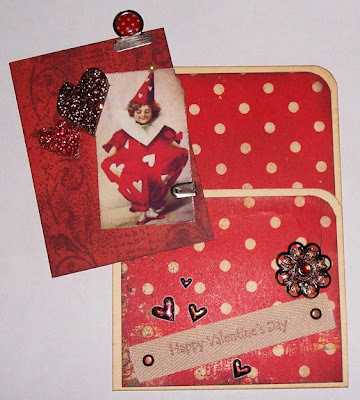 Sentiments are from Hero Arts and Purple Onion Designs. A flourish design was stamped on the front and back of tag. I embellished it with small stick on hearts, ribbons, and a glitter pen. Recently, I saw these snowmen posted on Two Peas in a Bucket. They were made by Linda Albrecht. When I saw these, I was absolutely blown away. I thought they were so creative, and so cute. I found myself thinking about Linda's snowmen a lot. I knew I wanted to try to create one of my own. One in my own style and theme. I went ahead and this is what I ended up with. My "snowperson" is made from a small bead jar which has a cork stopper and wooden scoop. I had a wooden ball that I used for the head. Just painted it and added pearls (with drawn pupils) for eyes and a red rhinestone nose. The hat was made from some real wool felt that I had. I sewed the back together to form a cone shape and cinched up the tassel at the top. I covered the cork stopper with a red iridescent pipe cleaner. I added a striped ribbon around the neck of the jar, and then a sheer ribbon was tied over it for the scarf. Silver foil ribbon spirals were added. Also, I added a clear button to the front. Like Linda did with her snowmen, I added the pearl beads to the inside of my jar. I used white and black rub ons on the outside of the jar. There are snowflakes all around it, with "joy" in the front. To personalize my snowman... I used the wooden scoop to form a safe place for my little birdy to live. I took a little piece of green dyed cheesecloth and placed it in the scoop. I perched my tiny little bird on top. To complete the project... I made my snowman look as though it was actually out in the snow. Around the neck of the bottle, I added glue and glitter. This worked fine, but I found that my Stickles worked just as well... if not better... to make snow. I could make it kind of thick and lumpy in spots. I put snow all around the jar, on the arm, on the wooden scoop and on my snowman's hat. I even gave the tiny bird a bit of snow on it's head and wings. I want to thank Linda Albrecht for her inspiration. I love my little snowman. I am happy how this project turned out. Maybe I will have to make more, so that my snowman has some friends. The more the merrier. I am actually very proud of myself as I started making my Christmas cards a bit earlier than I normally do. I am completely done and they will be in the mail in the next day or so. It is always a relief to get this done. I also spent most of my day and evening doing wrapping, wrapping, and more wrapping. Except for gifts to my husband and to local friends, all of the gifts we buy have to be shipped cross country. Needless to say, it is always a relief to see the boxes go on their way. They will be at the post office first thing in the morning... along with all of the others that are being shipped on the Post Office's infamous "Black Monday". Now, back to this years Christmas cards. A couple of years ago I found a lovely pack of Christmas card "blanks". The blanks came in a box of 50 cards with 10 different designs that were themed together. They worked out perfect for me, especially after getting them 1/2 price at Hobby Lobby. I looked for them last year and only found a set from DCWV that I wasn't thrilled with. I used a few of the designs, but the box still sits mostly unused. This year, I was in Hobby Lobby just after Thanksgiving and unexpectedly found a box of blanks by My Mind's Eye. I was so excited to find them. I instantly fell in love with the designs. The designs went perfectly with the stamps I had bought and planned to use this year. I wonder if My Minds Eye makes these sets exclusively for HL? Some patterns are obviously pieces from their old line "festive signature Christmas". This is my favorite card. The ornament is stamp in Brown Brilliance ink. The card is a patterned "blank", and the other printed paper is from Basic Grey. These are two more cards I made. I love this stamp. I used Brilliance Olive ink, and colored the bird with a brown Tombow marker. The first card blank vintage looking sheet music and the second one are deer. I added striped paper at the lower edge. 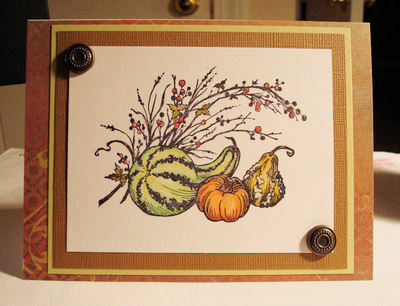 I used a chandelier stamp that I had with this card that reminds me of old wallpaper. I made the chandelier sparkle with bling. The edge is a brown piece punched with a scallop punch, and some more striped paper. I love this bird/nest stamp. It is a two part stamp by Memory Box. I just it was so sweet. I did several variations of this design. Here are a couple of variations of cards that used the same Memory Box stamps. I like how the saying seemed to fit with the family of birds. I really like the vintage feel of these. I printed some copies of a favorite image and added it to the cards. The first card uses a blank Cavallini label with a stamped sentiment. The second is a printed Cavallini label. These two cards were done in pretty much the same manner. The first one just has glitter added to the snow covered branches. Took an oversized tag and added a vintage Santa that was torn and layered onto the tag. Added other printed papers. Embellished with Christmas flowers (MM) and ribbons/vintage rayon tape. Added some glitter to the tree branches and sentiment. 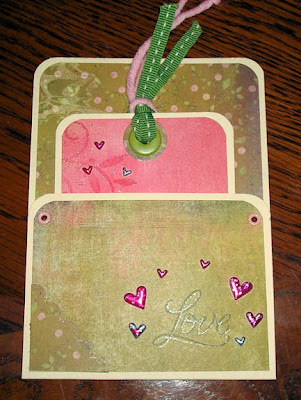 Basic card that I stamped and colored with colored pencils. Background paper is beautiful Memory Box. I just posted another new project at Buzz and Bloom. I made a fun Holiday organizer. I can keep track of holiday ideas, gift lists, menus, card lists, and dates. Check it out on their blog. I've got two new projects posted on Buzz and Bloom's Blog. 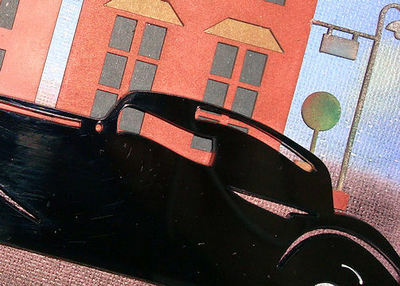 The projects use their new colored acrylic pieces, and some of their new chipboard also. I can't say enough about the excellent quality of their products. If you have never tried them, make a point to check them out. Here is a sneak peek of my "Night on the Town" canvas, and "Guess Who Loves You?" layout.